President Ronald Reagan's famous exhortation when visiting Berlin in 1987 has long been widely cited as the clarion call that brought the Cold War to an end. The United States won, so this version of history goes, because Ronald Reagan stood firm against the USSR; American resoluteness brought the evil empire to its knees. Michael Meyer, who was there at the time as a Newsweek bureau chief, begs to differ. In this extraordinarily compelling account of the revolutions that roiled Eastern Europe in 1989, Meyer shows that American intransigence was only one of many factors that provoked world-shaking change. He draws together breathtakingly vivid, on-the-ground accounts of the rise of the Solidarity movement in Poland, the stealth opening of the Hungarian border, the Velvet Revolution in Prague, and the collapse of the infamous wall in Berlin. 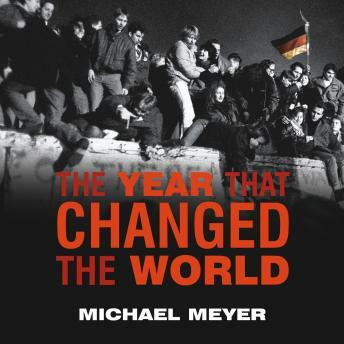 But the most important events, Meyer contends, occurred secretly, in the heroic stands taken by individuals in the thick of the struggle-leaders such as poet and playwright Vaclav Havel in Prague; the Baltic shipwright Lech Walesa; the quietly determined reform prime minister in Budapest, Miklos Nemeth; and the man who privately realized that his empire was already lost and decided, with courage and intelligence, to let it go in peace, Mikhail Gorbachev, the Soviet general secretary of the Communist party. Reporting for Newsweek from the frontlines in Eastern Europe, Meyer spoke to these players and countless others. Alongside their deliberate interventions were also the happenstance and human error of history that are always present when events accelerate to breakneck speed. Meyer captures these heady days in all of their rich drama and unpredictability. In doing so he provides not just a thrilling chronicle of the most important year of the twentieth century but also a crucial refutation of American political mythology and a triumphal misunderstanding of history that seduced the United States into many of the intractable conflicts it faces today. The Year That Changed the World will change not only how we see the past, but also our understanding of America's future.